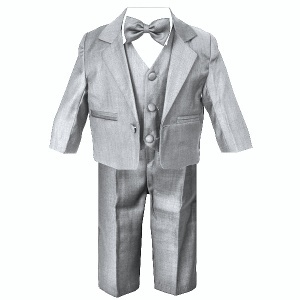 Baby boys silver grey 5 piece bow tie suit, perfect for many occasions including a wedding or formal occasion. Jacket: Fully lined silver grey jacket, double pockets on front, centre button fastening with matching buttons on cuffs. Waistcoat: Fully lined silver grey waistcoat, 3 centre buttons, adjustable strap/buckle on back for perfect fit. Trousers: Pleated silver grey trousers, side pockets, elasticated waist for comfort. Shirt: Long sleeved white shirt, full-length centre buttons, double buttoned cuffs, down-collar, traditional ribbed effect on front of shirt. Bow Tie: Matching silver grey bow-tie with an adjustable fastening at the back for the perfect fit, complimenting the suit perfectly. Making your little one look like the perfect handsome gentleman at a christening, as a baby pageboy or guest at a wedding or a formal evening occasion. Complete with all original tags, protective suit covering, hanger and spare buttons. 3 Months 8.5" 15" 16"-18" 21" 6" 9"
6 Months 9.5" 16" 18"-20" 22" 7" 10"
9 Months 10" 17" 18"-20" 22" 7.5" 10.5"
12 Months 11" 17.5" 18"-20" 22" 8" 11"
18 Months 12" 18.5" 20"-22" 23" 9" 12"
24 Months 13" 21" 20"-22" 24" 10" 13"